In a highly competitive global laboratory water purifier market a large number regional and well-entrenched international players are seen trying to outshine one another. Some of the popular strategies of bigger manufacturers – both regional and international ones - are focus of product differentiation by leveraging latest cutting-edge technologies. Other means adopted by companies to grow their market shares are acquisitions and strategic partnerships. Apart from that, dominant players are also known to leverage solid distribution networks and after-sales service to cement their positions. Factors promoting the growth in the global laboratory water purifier market is the technological advancement leading to the emergence of products with better functionalities, their increasing number of applications, and the booming ecommerce sector. Providing headwinds to the global laboratory water purifier market, on the other hand, is the lack of knowledge among buyers which regard to the specific purification technique they require. Helping to overcome the issue is the continued progress in technology which are slated to open up new avenues of growth. As per a report by Transparency Market Research, the global laboratory water purifier market slated to attain a value of US$19.259 bn by 2022 from US$10.060 bn in 2016 by rising at a 11.6% CAGR from 2017 to 2022. Several laboratory applications such as mammalian cell culture, liquid chromatography, and laboratory glassware, among others need water as a solvent. The degree of purity, however, varies from application to application. Water purity or quality is determined by professional organizations, namely Clinical and Laboratory Standards Institute (CLSI), ASTM International, ISO, etc. ASTM, CLSI and ISO classify purified water for into three types – type I, type II, and type III. Their parameters for classification are not exactly identical. At present, type I is used to classify water that is most pure. Type I accounts for maximum market share owing to their growing applications in crucial laboratory processes such as high performance liquid chromatography (HPLC). In 2016, the segment accounted for 42.0% share in the market. 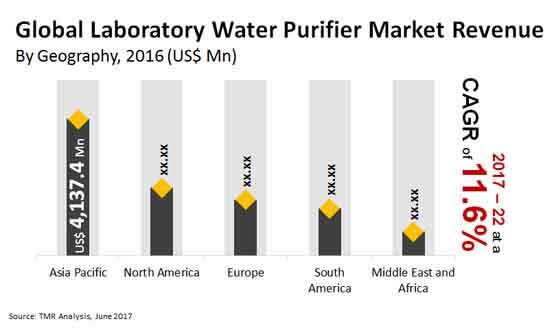 From a geographical standpoint, Asia Pacific contributes the most to the revenue in the global laboratory water purifier market. In 2016, the region’s share vis-à-vis revenue was worth 41.0%. In the years ahead too, Asia Pacific is expected to hold on to its dominant position because of China and Japan which have made substantial investments in healthcare applications. Besides, Japan and China, India is another key market that holds out a strong promise of growth due to rise in the government’s spending on research and development of environmental labs to work on environmental issues. North America trails Asia Pacific in the global laboratory water purifier market in terms of revenue. The U.S. is a key market in North America because of the well established distribution network of the players, increased health awareness, and liberal allocation for the healthcare sector by government. Europe is another major market whose growth in the near future will be brought about by the high concentration of regional players, increased investments in technology, and awareness and subsequent demand for innovative products. Latin America region too, supported by favorable regulatory laws, is expected to show sustainable growth during the forecast period. Some of the prominent participants in the global laboratory water purifier market are Merck KGaA, Elga Labwater, Sartorious AG, Thermo Fisher Scientific Inc., Aqua Solutions, Inc., Evoqua Water Technologies LLC, Pall Corporation, Purite Ltd., and Chengdu Ultrapure Technology Co. Ltd. This report aims to provide a comprehensive strategic analysis of the global laboratory water purifier market along with revenue and growth forecasts for the period from 2011 to 2022. With advancements in laboratory water purification systems and rising adoption of these systems in various applications, the laboratory water purifier market is expected to experience high growth in the coming years. Some of the factors supporting the growth of the market worldwide include the emergence of e-commerce and increased technological investments in developing regions such as Asia Pacific, high demand from the health care sector and advent of industry specific laboratory water purifier systems in developed regions such as North America and Europe. The impact of these and other macro-micro economic factors has been analyzed while developing the market growth models. This research study on the global laboratory water purifier market provides a detailed analysis of laboratory water purifier used for different applications by end-users depending upon their needs. The report offers an in-depth study of the market drivers, restraints, and growth opportunities. Using these factors, the study identifies various trends prominent in the industry which are expected to influence the market growth during the forecast period from 2017 to 2022. It includes a comprehensive coverage of the underlying economic and technological factors influencing the laboratory water purifier market growth. It provides the competitive landscape of key players in the laboratory water purifier market in order to highlight the state of competition therein. The report also provides a detailed competitive analysis of the key players in the market and identifies various business strategies adopted by them. The study explains the penetration within each market segment across various geographies, and how these segments have accelerated the growth of the market as a whole. The global laboratory water purifier market is analyzed by segmenting it on the basis of mode of use, type, application, distribution channel and end-use industry. Based on mode of use, the market is classified into point of use, large central systems and clinical analyzers. In terms of type, the market is segmented into type I (ultrapure), type II (pure) and type III (RO water). On the basis of application, the laboratory water purifier market is classified into high performance liquid chromatography (HPLC), immunochemistry, ion chromatography, mammalian cell culture and autoclave among others. Basis distribution channel, the market is segmented into direct sales, distributors and online. Based on end-use industry, the market is categorized into environment, food, oil & gas, academic & government and healthcare. Healthcare segment is further fragmented into pharmaceuticals, hospitals and clinical diagnostics & OEM. Geographically, the global market for laboratory water purifier has been segmented into five regions: North America, Europe, Asia Pacific, Latin America and Rest of World. The market size and forecast for each region has been provided for the period from 2011 to 2022 along with the CAGR (%) for the forecast period from 2017 to 2022. The study also includes quantitative analysis of the competitive scenario for major countries/regions such as the U.S., Canada, the U.K., Germany, France, Japan, India. The analysis by mode of use, type, application, distribution channel, end-use industry and regions helps in evaluating the present scenario and growth prospects of the laboratory water purifier market over the forecast period from 2017 to 2022. The report concludes with the profiles of major players in the laboratory water purifier market on the basis of various attributes, such as company overview, financial overview, business strategies, SWOT analysis and segment presence. Some of the major players in the global laboratory water purifier market with the significant developments are Merck KGaA, Elga Labwater, Sartorious AG, Thermo Fisher Scientific Inc., Aqua Solutions, Inc., Evoqua Water Technologies LLC, Pall Corporation, Purite Ltd. and Chengdu Ultrapure Technology Co. Ltd., among others.